Located just 10 minutes outside of Ubud in Bali, Goa Gajah is a significant Hindu archaeological site. Goa Gajah is locally known as the Elephant Cave because of its close proximity to the Elephant River. A mysterious cave, relics, and ancient bathing pools set amid green rice paddies and a garden lure tourists from nearby Ubud. The menacing entrance to Goa Gajah looks like a demonic mouth, suggesting that people are entering an underworld as they venture inside through the darkness. 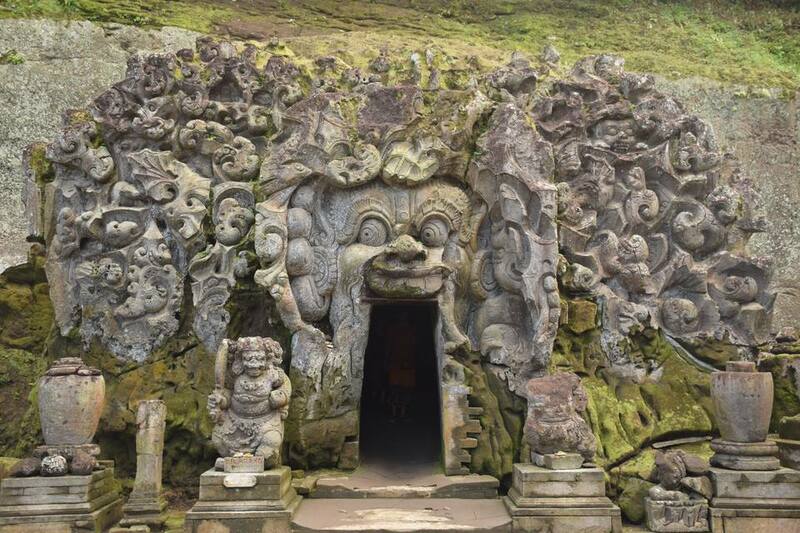 Some claim that the entrance represents the Hindu earth god Bhoma while others say the mouth belongs to the child-eating witch Rangda from Balinese mythology. Goa Gajah is thought to date back to the 11th century, although relics predating this time were found within proximity of the site. The first mention of Goa Gajah and the Elephant Cave was in the Javanese poem Desawarnana written in 1365. Despite the ancient significance of the Elephant Cave, the last excavation took place during the 1950s; many sites still remain unexplored. Literal piles of relics with unknown origins have been laid out in a surrounding garden. The leading theory suggests that Goa Gajah was used as a hermitage or sanctuary by Hindu priests who dug the cave entirely by hand. Although accredited as a sacred Hindu site (one of many Hindu temples around Bali), a number of relics and the close proximity of a Buddhist temple suggest that the site held special significance to early Buddhists in Bali. For such a busy tourist attraction, the Elephant Cave itself is actually quite small. As you enter through the dark, narrow passage, the cave abruptly ends in an intersection. The left passage contains a small niche with a statue of Ganesh, the Hindu deity reminiscent of an elephant. The right passage holds a small worship area with several stone lingam and yoni in honor of Shiva. Goa Gajah is nearly surrounded by ancient Hindu temples easily accessible from the main roads. Read about Pura Besakih, Bali's most sacred Hindu temple. Goa Gajah is open seven days a week from 8 a.m. to 4:30 p.m. The entrance fee to the Elephant Cave is around 15,000 rupiah, or about $1.15 (read about money in Indonesia). Proper dress is required; knees must be covered by both men and women. Sarongs are available on loan at the entrance of the site. Goa Gajah is still an active worship site - try not to get in the way of worshippers inside the narrow cave. Do not photograph people during their prostrations. Be prepared to be plunged into near darkness as you enter the cave; there is no artificial lighting. Goa Gajah suffers from a dreadful lack of signs and any explanations in English. Visitors who are serious about exploring Bali's Hindu past should consider venturing to Pura Besakih. Other than the religious and archaeological significance, the real draw of Goa Gajah is the beautiful surrounding. The Elephant Cave only takes minutes to explore, however rice paddies, gardens, and stone steps lead to other beautiful settings. Smart visitors climb the long flight of stairs down into the shady valley where a small waterfall awaits. The remains of a crumbled Buddhist temple rest nearby; ancient stones with carved reliefs lie strewn with boulders in the river as rushing water erases history. The Elephant Cave is located just 10 minutes southeast of Ubud in Central Bali, Indonesia. Tours that take in Goa Gajah, as well as other surrounding temples and sites, can be arranged in Ubud. Alternatively, motorbikes can be rented in Ubud for around $5 a day. Having the freedom of transportation to explore the smaller tourist sites surrounding Ubud is a big plus. Begin by driving south of Ubud past the monkey sanctuary toward Bedulu, then turn east (left) onto Jalan Raya Goa Gajah. Numerous signs indicate the way to Goa Gajah as well as other attractions. A trivial fee is charged for parking at the Elephant Cave.